The relationship between critically approved and sales is notoriously difficult to quantify in the world of entertainment. Only one of the ten highest grossing movies of 2015, Disney’s Inside Out, has made to the top ten of Metacritic’s aggregate scores for reviews in that year, placing fourth on the list with a score of 94 out of 100. Most of the highest grossing films achieved scores in the range of 50s and 60s, with Minions scoring as low as 56 yet grossing over 300 million dollars. The poor correlation between critical approval and revenues in the film industry suggests that there are other factors, such as marketing, that may be more important to sales than the intrinsic “quality” of a piece of entertainment. Is the same true in the gaming industry or do different rules apply? A glance at the top ten bestsellers on the Playstation Network (PSN) in 2015 reveals several well known gaming “brands” – the latest releases in the Grand Theft Auto, Call of Duty, Fallout, Fifa, and Mortal Kombat series, plus a Star Wars release, Star Wars Battlefront, a game timed to tie in with the movie Star Wars: The Force Awakens. Clearly, then, mega brands – and the heavily financed marketing campaigns that attend them – do play a role in the gaming world. These initial impressions appear to be confirmed by a comparison of the top ten PSN sellers in 2015 with the top ten PS4 games on Metacritic. Only two 2015 titles, The Witcher 3: Wild Hunt and Bloodborne, appear on both the bestselling and best reviewed lists for that year. Look a little further afield, however, and a more complex pattern emerges. Another member of the 2015 bestsellers, Grand Theft Auto V, is in fact the PS4 release with the highest Metacritic score of all time, 97; only its 2014 release date excludes it from the 2015 Metacritic list. The third highest reviewed PS4 game of all time, Metal Gear Solid V: The Phantom Pain, was the 20th highest seller on PSN in 2015. Fallout 4, Destiny, and Batman: Arkham Knight also make the top 20 of both PSN sellers and Metacritic reviews in 2015. 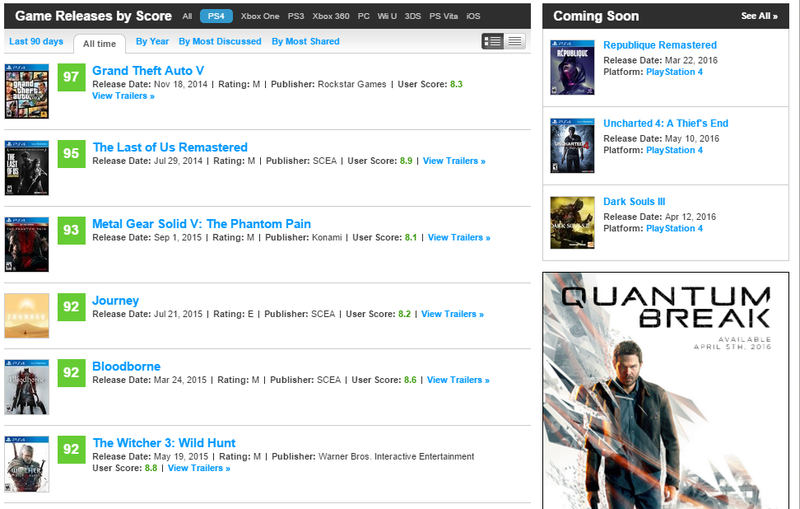 All told, then, seven PS4 releases can be considered among the 20 highest sellers and best reviewed games in 2015, a feat managed in the movie world only by Inside Out. It appears that in the gaming world the quality of a product is important and will influence sales. There are exceptions, for example the No 1 top seller of 2015, Call of Duty Black Ops 3, was not even in the top 20 review scores, but most of games follow the rule.